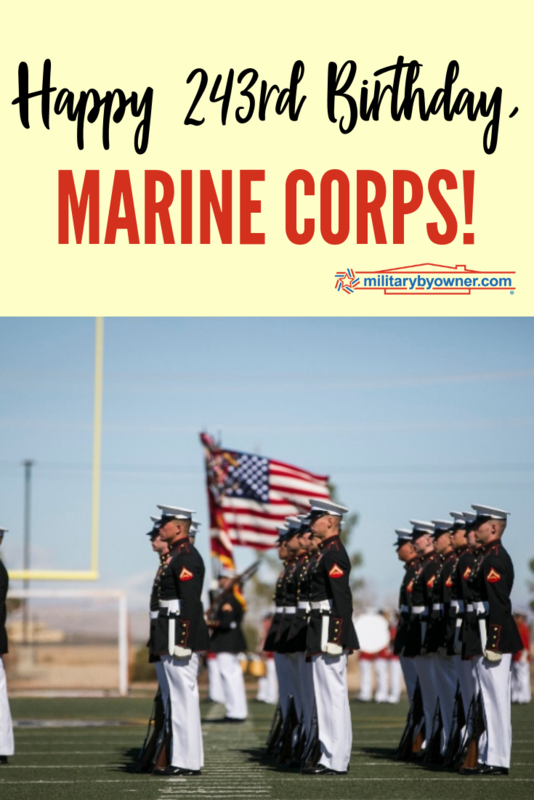 Happy 243rd Birthday, Marine Corps! As with many great things, the Marine Corps started in a bar. And look at what they’ve accomplished! The few, the proud. These Marines grew from a handful of eager men ready to serve our country into a group of men and women numbering well over 200,000. Unfamiliar with their unconventional start? Here’s a little history. During the American Revolution, the inns and taverns of Philadelphia were the backdrops for many important political discussions. 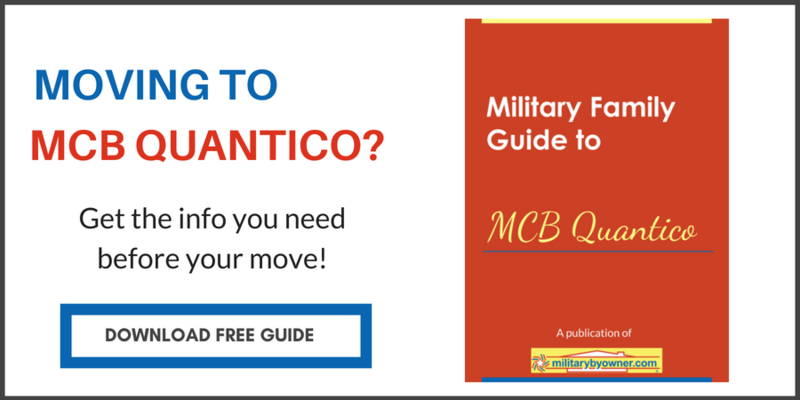 One of these conversations was started by a committee of the Continental Congress in Tun Tavern, (the birthplace of the Marine Corps), where they drafted a resolution calling for two battalions of Marines trained to fight both on land and at sea. 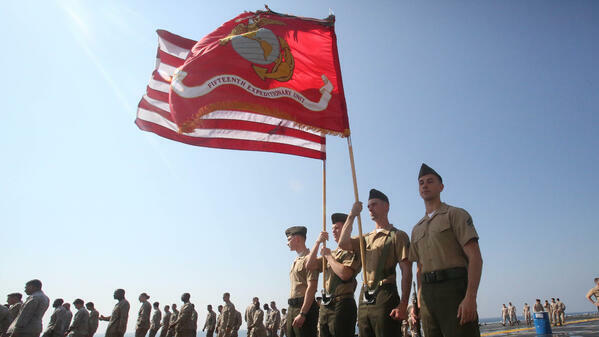 The resolution was approved on November 10, 1775, marking the official forming of the Continental Marines. And Tun Tavern was used as a recruiting rendezvous for the first Marines. In honor of their birthday, let’s take a look at a few things our Marines accomplished this past year. 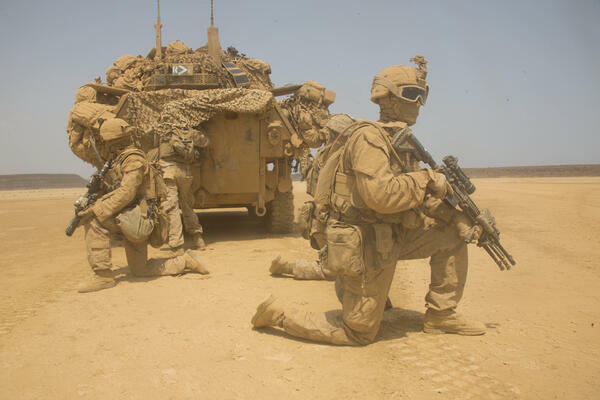 DJIBOUTI - DJIBOUTI (Sept. 15, 2018) Marines assigned to red platoon of the Light Armored Reconnaissance Company of Battalion Landing Team 3/1, 13th Marine Expeditionary Unit, set up security boundaries outside of their vehicle during Theater Amphibious Combat Rehearsal (TACR) 18. Led by Naval Amphibious Force, Task Force 51/5th Marine Expeditionary Brigade, TACR integrates U.S. Navy and Marine Corps assets to practice and rehearse a range of critical combat-related capabilities available to U.S. Central Command, both afloat and ashore, to promote stability and security in the region. NORTHERN TERRITORY, Australia - Pilots of MV-22 Osprey tiltrotor aircraft from Marine Medium Tiltrotor Squadron 268, take part in aerial refueling recertification over Northern Territory, Australia, Aug. 17, 2018. Two KC-130 Hercules aircraft from Marine Aerial Refueler Transport Squadron 152, took part in the training in order to allow the Osprey pilots to fly their aircraft back to Hawaii at the end of the Marine Rotational Force – Darwin 18 deployment. 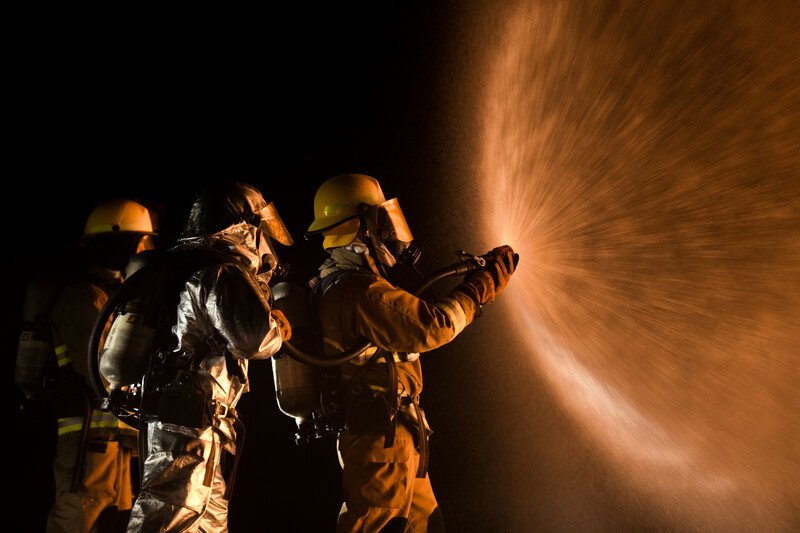 MARINE CORPS AIR STATION BEAUFORT, South Carolina - Aircraft Rescue and Fire Fighting Marines conduct a controlled burn training exercise aboard Marine Corps Air Station Beaufort July 30. 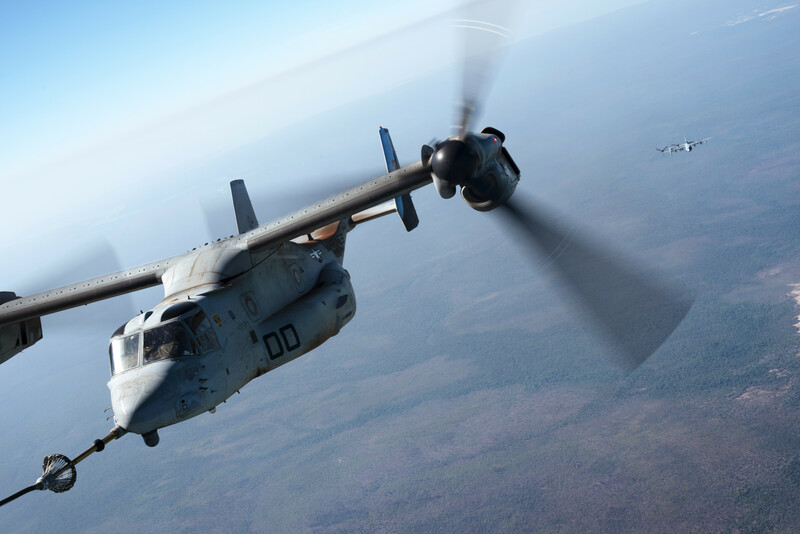 The training simulated a jet fire and familiarized the Marines with their equipment and standard operating procedures. MCAS Beaufort’s ARFF unit is responsible to respond to fires not only aboard the air station, but also throughout Beaufort County. BRIDGEPORT, California - Lance Cpl. 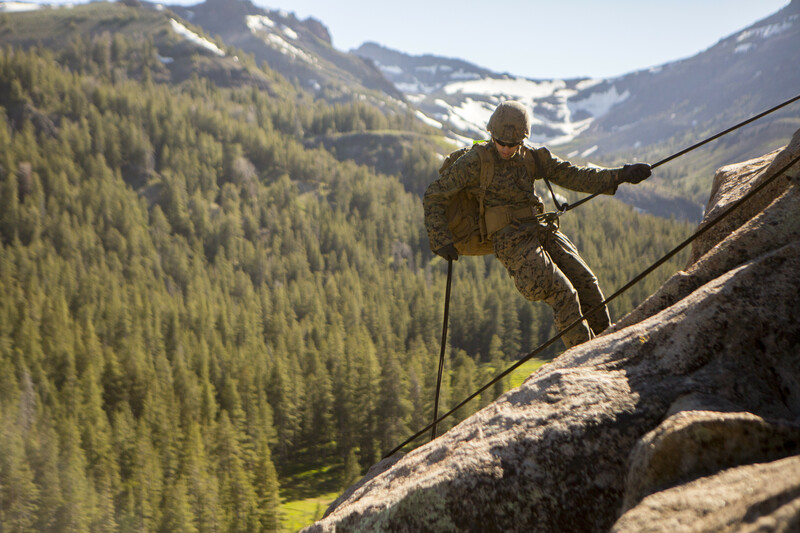 Garrett Hamilton, a rifleman with 2nd Battalion, 24th Marine Regiment, 23rd Marines, 4th Marine Division, rappels down a cliffside during Mountain Exercise 3-18, at Mountain Warfare Training Center, Bridgeport, Calif., June 22, 2018. After completing Integrated Training Exercise 4-17 last year, 2nd Bn., 24th Marines took part in MTX 3-18 to further develop small-unit leadership and build an understanding of the different climates and scenarios they could face in the future. HIGHTOWN, U.K. - U.S. Marine Corps Sgt. 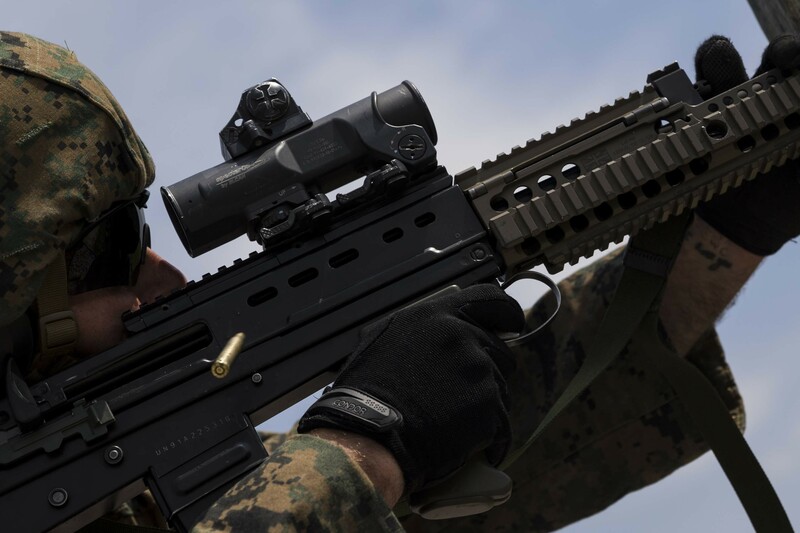 Victor Netta, chief primary marksmanship instructor, Marksmanship Training Company, Weapons Training Battalion, fires down range with a SA80 A2 assault rifle during the Royal Marine Operational Shooting Competition at Altcar Training Camp, Hightown, United Kingdom, May 21, 2018. The U.S. Marine Corps travels to the United Kingdom annually to compete in the with the opportunity to exchange operational experiences, physical and marksmanship training. 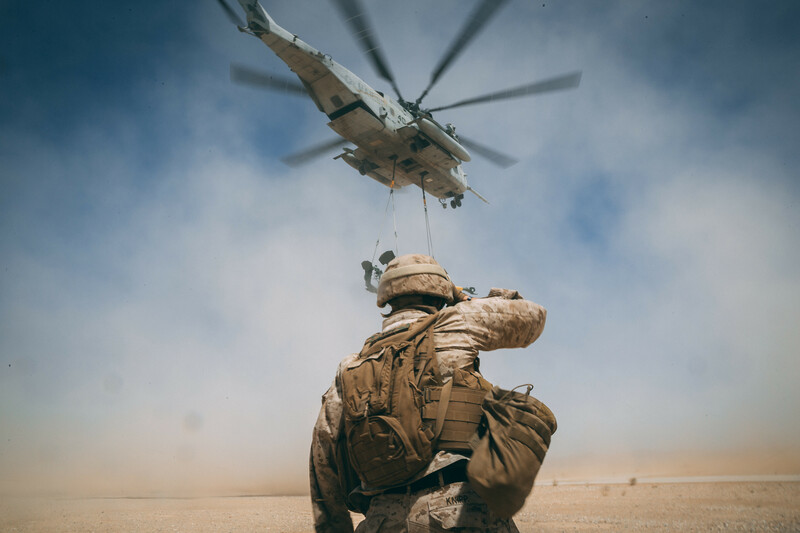 Twentynine Palms, Calif. - A Marine with combat logistics battalion 8, 2 marine logistics group watches a CH-53E Super Stallion carry away M777 Howitzer at Sand Hill Marine Corps Air Ground Combat Center, Twentynine Palms, Calif., Apr 27, 2018, as a part of Integrated Training Exercise 3-18. The purpose of ITX is to create a challenging, realistic training environment that produces combat-ready forces capable of operating as an integrated MAGTF. 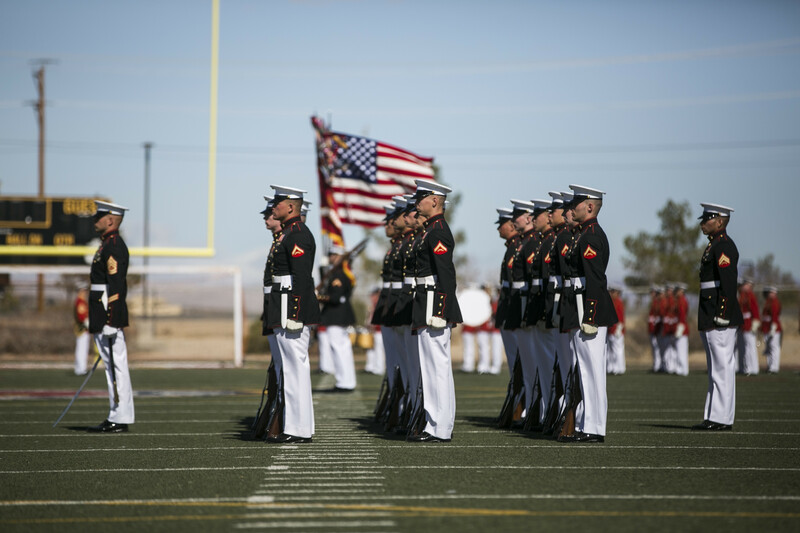 MARINE CORPS AIR GROUND COMBAT CENTER TWENTYNINE PALMS, Calif - The U.S. Marine Corps Silent Drill Platoon, Battle Colors Detachment, Marine Barracks Washington, D.C., stands in formation as the colors are presented during the Battle Colors Ceremony at Felix Field aboard Marine Corps Air Ground Combat Center, Twentynine Palms, Calif., March 14, 2018. The ceremony is held to honor Marine Corps traditions through the Drum Corps, the Silent Drill Platoon and the Battle Colors Detachment. MARINE CORPS BASE CAMP LEJEUNE, N.C. - Pfc. 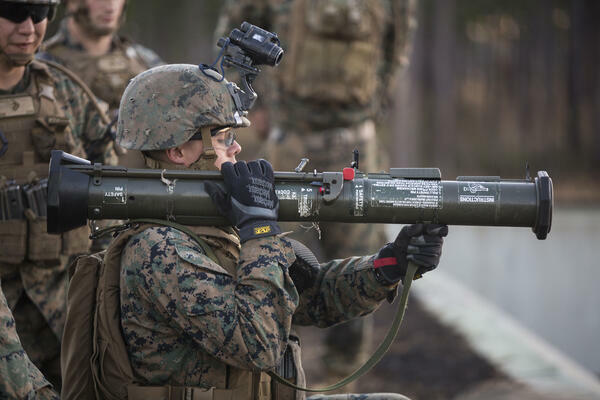 Kyle Hill readies to fire an AT-4 rocket launcher as part of a live-fire exercise on Marine Corps Base Camp Lejeune, N.C., Jan. 24, 2018. The Marines with 1st Battalion, 2nd Marine Regiment conducted immediate remedial action drills and traversed, searched and engaged targets moving from one to another. Hill is an infantry Marine with 1/2. 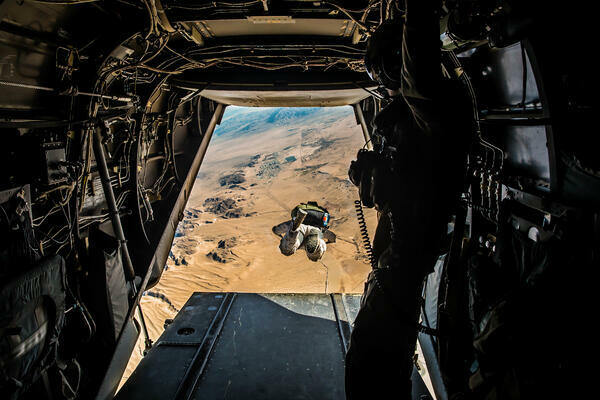 Twentynine Palms, Calif. - Marines with 3rd Reconnaissance Battalion, 3rd Marine Division, 3rd Marine Expeditionary Force conduct a jump out of an MV-22 Osprey at Marine Corps Air Ground Combat Center, Twentynine Palms, Calif., Jan. 18, 2018, as a part of Integrated Training Exercise 2-18. The purpose of ITX is to create a challenging, realistic training environment that produces combat-ready forces capable of operating as an integrated MAGTF. 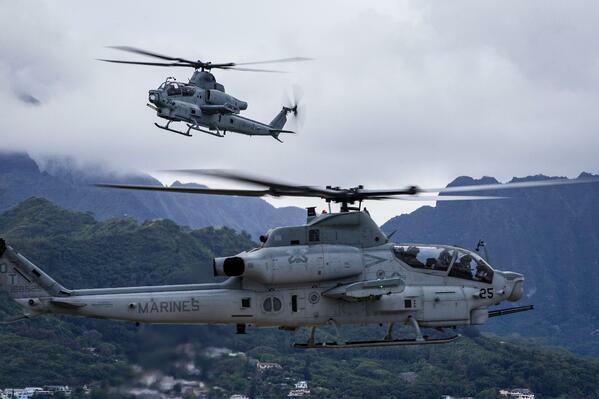 MARINE CORPS BASE HAWAII, Hawaii - Hawaii’s first three AH-1Z Vipers arrive aboard Marine Corps Air Station, Kaneohe Bay, Dec. 19, 2017. 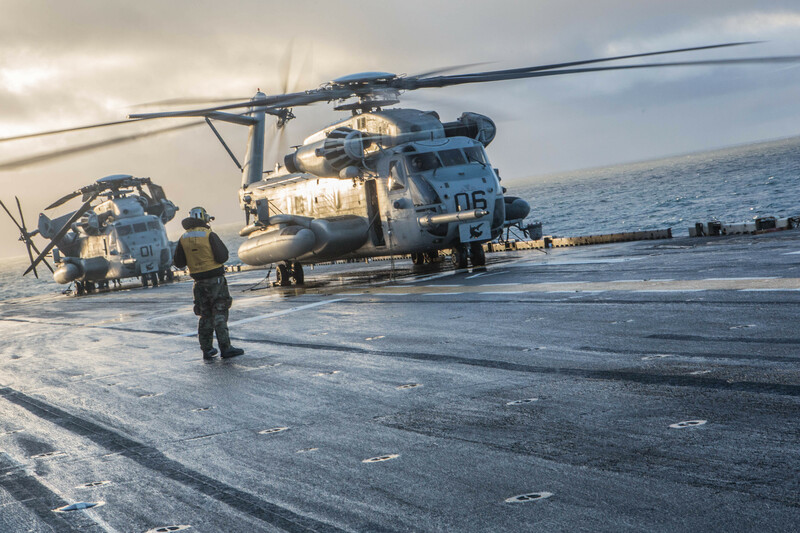 The arrival of the 4th generation attack helicopters enhances the capabilities and power projection of Marine Light Attack Helicopter Squadron 367, Marine Aircraft Group 24, 1st Marine Aircraft Wing and MCBH. U.S. 5th Fleet Area of Responsibility - Marines assigned to the 15th Marine Expeditionary Unit aboard the amphibious assault ship USS America (LHA 6) parade the colors on the flight deck during a celebration of the 242nd birthday of the Marine Corps. America is deployed to the U.S. 5th Fleet area of operations in support of maritime security operations designed to reassure allies and partners, and preserve the freedom of navigation and the free flow of commerce in the region. To all our nation’s Marines and families, we say thank you for all you do!